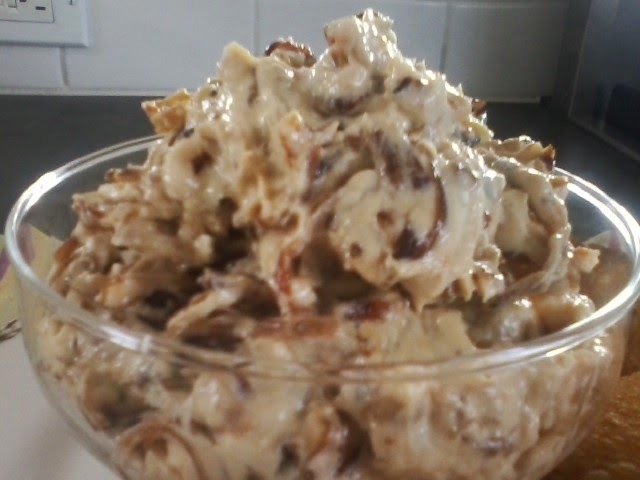 I have always been a lover of onion dip...quite frankly, I think most of us are. Back in my day, we tore open the package of Lipton onion soup mix, added sour cream and voila, we had onion dip. Now that I'm getting further away from packaged items, it's sometimes a challenge to find a recipe that equates to the flavor of the packaged item I once knew. Perfect example...nothing beats the Oreo, in my book, and to my knowledge, no one has created a clone of it. So, on the rare occasion that I have a craving for them (when I was a kid my father used to call them "sawdust cookies"), I will buy them, and usually go through 20 at a time with a glass of milk. But, it's not about the Oreo here, it's about the onion dip. 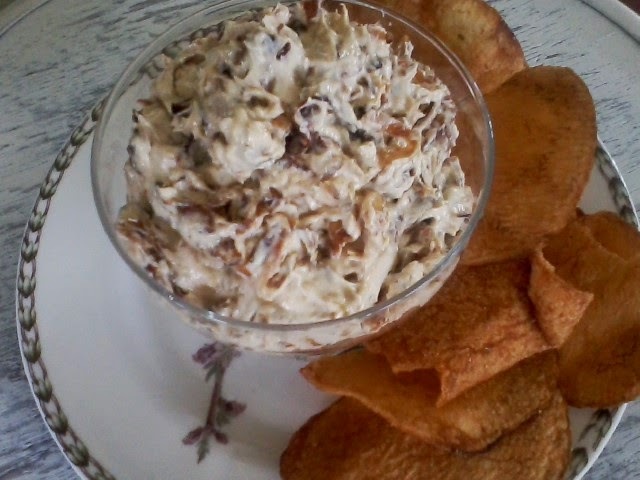 I have made this onion dip for many, many years, and it has been my "go to" appetizer for luncheons, outside get-togethers, etc. If I am having four people, including myself, for a get-together, I will make this and put the dip in individual ramekins. That way, everyone can pig out on their own portion, and we all can see who did the most eating, and the least talking. I have added the thyme and white wine to give the dip some different, but subtle notes. 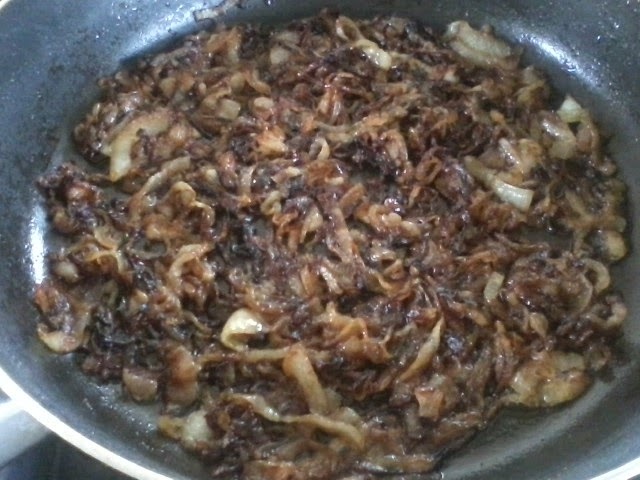 The most tedious part about making this recipe is caramelizing the onions. It usually takes about 20-25 minutes...there's no way you can rush this process, as seen by my pictures below. But, it is well worth the "watch pot, doesn't boil" theory, and when all is said and done, your friends will have asked for this recipe before they even got their coats on to go home. Place the butter and olive oil in a very large saute pan on medium heat. 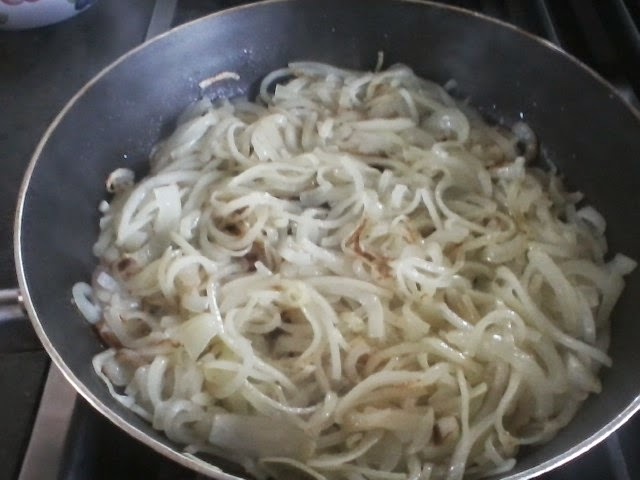 Add onions, and SLOWLY brown in pan, stirring occasionally. About 5 minutes before you are ready to take the onions out of the pan, add the thyme, rubbing it with your fingers to produce the best flavor, and white wine. On low heat, let the wine reduce and this will take another 5 minutes. Remove onions from pan. I usually place them on a plate lined with paper towel to get rid of any excess oil/butter. In a mixing bowl (I use my Kitchenaid standing mixer) blend the cream cheese, sour cream, mayo and salt. Add the cayenne pepper and incorporate. 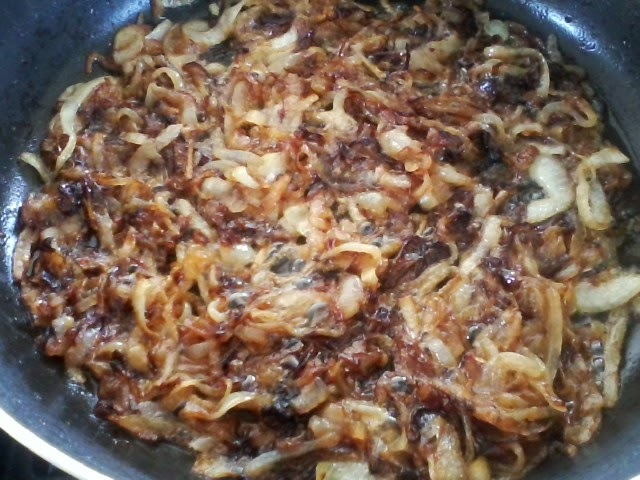 Add all the onions and mix until the dip gets a nice light brown color. Your ready for the party! Bon appetit! Ya, ya...I know it sounds like a zillion calories, and it probably is...but this cake is worth making every once in awhile when you want something with depth, yet is not super sugary, but has a lot of elements and subtle flavors that bring it all together. It is a lovely cake, and if everyone you are serving this to is a fan of the ingredients below, they will sing you their praises. Place the pecans in a single layer on a baking sheet lined with parchment. Bake at 350 for 5 to 7 minutes or until toasted, (they should be fragrant after taking them out of the oven). Cool on pan for about 15 minutes. Reduce oven to 325. Beat butter and cream cheese at medium speed with mixer until creamy. Gradually add brown sugar, beating until well blended. Add eggs, one at a time, beating just until blended after each addition. Sift together flour, baking powder, baking soda and salt. Add to butter mixture alternately with sour cream, beginning and ending with the flour mixture. Stir in pecans and vanilla. Spoon batter into a greased and floured tube or bundt pan and bake for 1 hour 15 minutes or until toothpick comes out clean. Cool for 10 minutes, then invert onto a rack. Cool completely before icing. You will want to prepare the icing right before you put on the cake. Bon appetit! Bring sugar, butter and milk to a boil in medium saucepan over medium heat, whisking constantly. Boil for 1 minute, continuing to whisk. Remove from heat and whisk in sugar and vanilla until smooth. 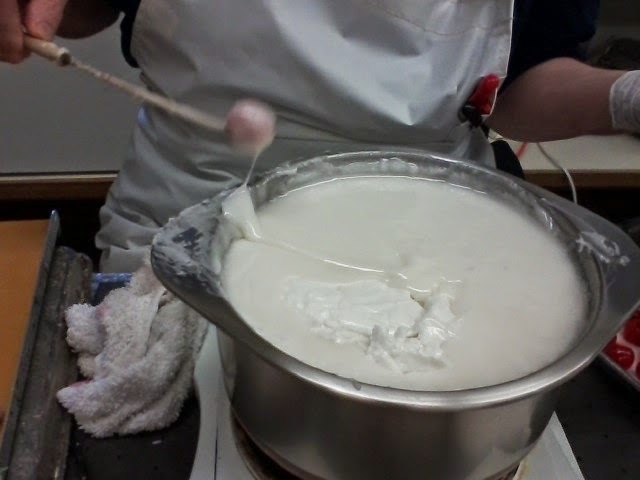 Stir every few minutes until mixture begins to cool and thickens slightly. Ice cake immediately. 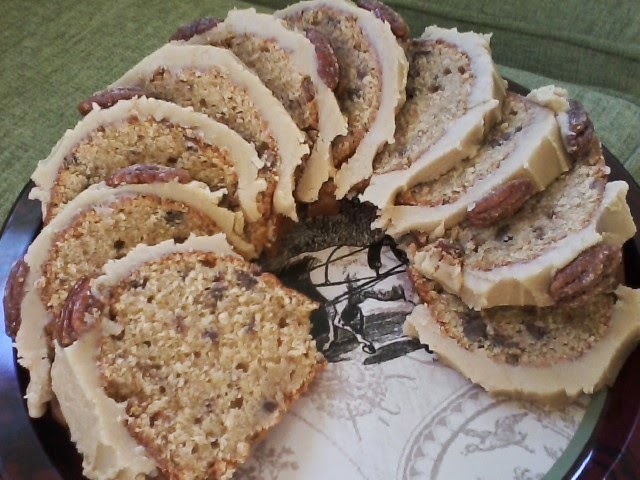 The icing can be somewhat fickle. If you don't cool enough, it will run down the cake onto the plate. If you cool too much, it won't run down the cake. One time I put the pan in a bowl of ice water, and after a minute, it was just right. But, I decided to put it back for another minute, and then it was too thick. In this case, you should put pan back on a low flame for a few minutes, whisking to bring back to a thinner consistency. Whisk brown sugar, cream and salt in a bowl. Add pecans and stir until completely coated. Place individual pecans on parchment lined pan and bake at 400 for about 10 minutes-15 minutes, until pecans look crusty. Do not turn over. Remove from oven. Pick up each pecan and put on another piece of parchment...they will harden in a few minutes. 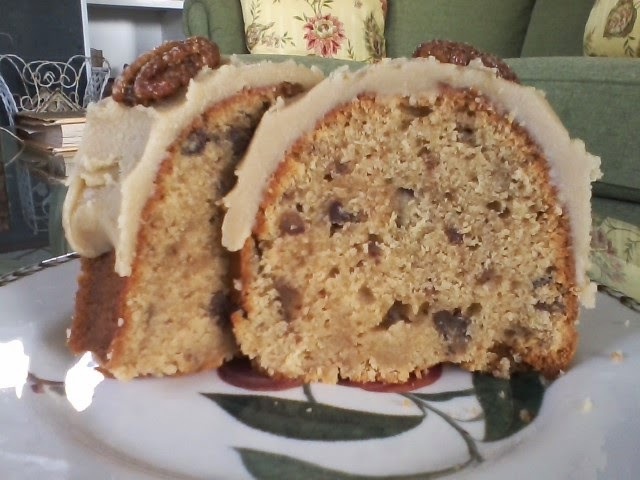 After icing cake, you can chop nuts or place whole on top of cake. Chicken wings? I'm there. Fried, baked, barbecued. 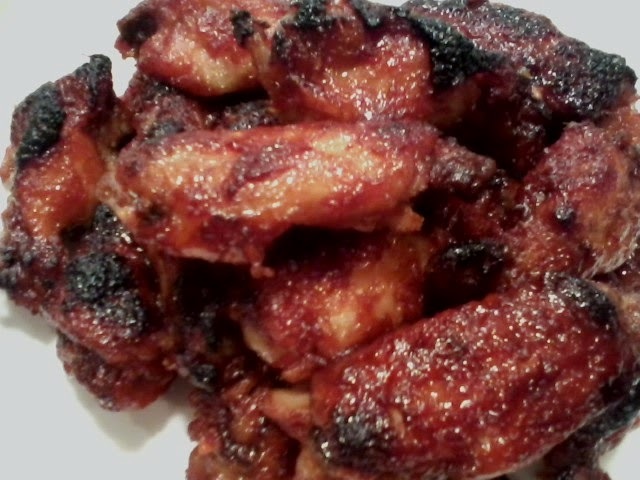 These wings are super easy, super delicious and made in the oven. Great for a party, picnic, football game, and cleanup is a snap. In a small saucepan, whisk together the pomegranate juice, soy sauce, ginger, garlic, lemon zest, sugar, pepper flakes, lemon juice and cornstarch. Set the pan over medium heat and bring to a boil, whisking constantly to thicken. Mixture will be very thick. Let cool. If using whole wings, disjoint and put them in a large bowl and set aside. Preheat oven to 375. Add the sauce mixture to the bowl with the chicken and mix well to coat evenly. Line a 9x13 pan with either two sheets regular tin foil or one sheet heavy-duty tin foil. Spray foil lightly with cooking spray. 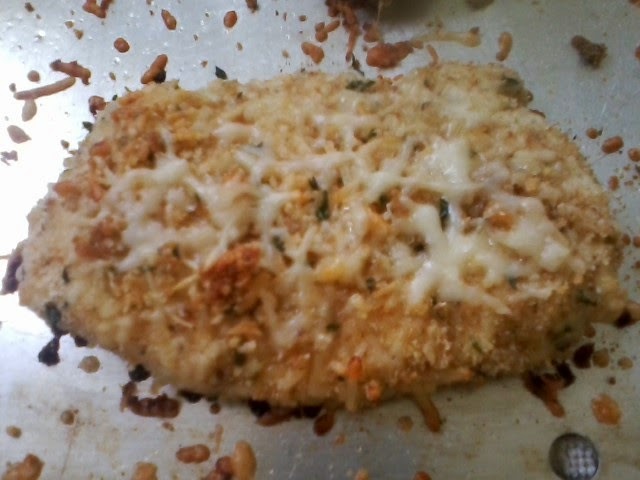 Arrange the chicken and the rest of the sauce in a single layer in the pan. Bake for 30 minutes. Stir and turn the chicken pieces over and bake for 20 minutes more. Stir and turn the chicken pieces again and bake for 10 minutes more, or until chicken is tender and sauce is thick and glazy. Total cooking time should be about one hour. Stir the chicken in the sauce once more, then transfer chicken to a serving platter. Bon appetit! 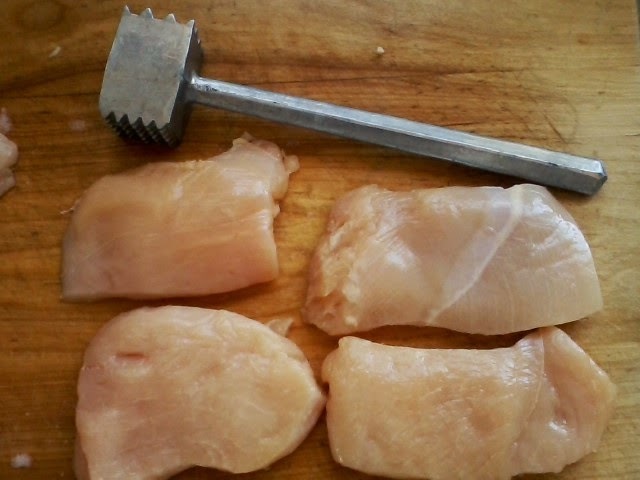 I usually put all the chicken breasts on a cutting board, place a piece of plastic wrap over the whole thing, and using a metal mallet, or rolling pin, flatten so they are just about uniform. Have egg whites in a bowl. 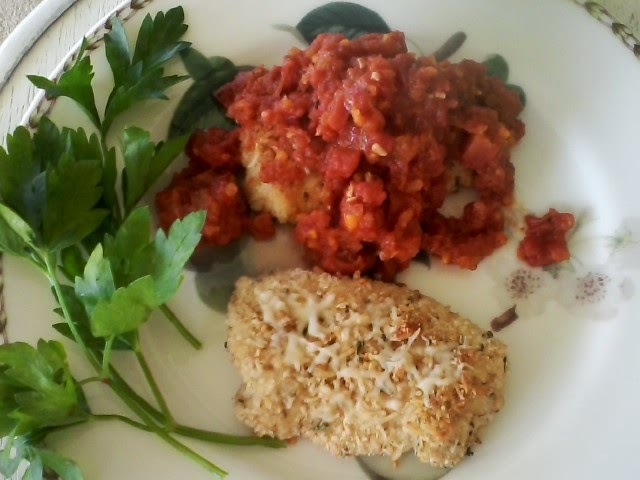 In a flat casserole dish, put in breadcrumbs, basil, salt and parmesan cheese. Mix together with a fork. Heat oven to 425 and have a sheet pan lined with parchment ready to go. Dip each piece of chicken in the egg whites and place in breadcrumbs, and with the other hand, coat the chicken with the crumbs. Place on baking sheet. Bake for 10 minutes, turn over and bake another ten. 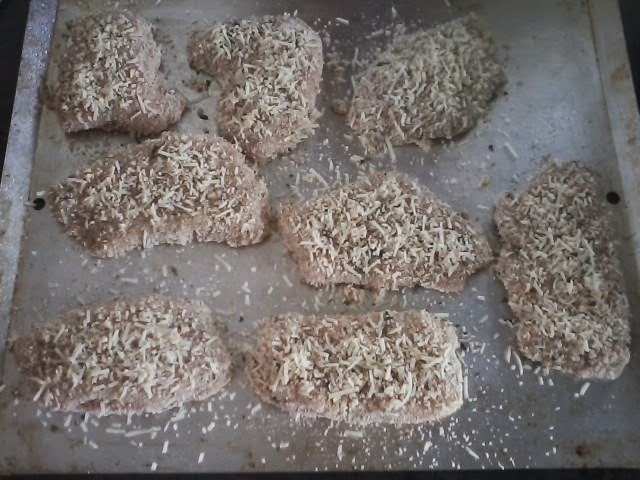 Take out of the oven and place more grated cheese on each piece. Place pieces of chicken onto cooling rack so the bottom of each piece doesn't get soggy. Cover with your favorite pasta sauce and serve with pasta. Bon appetit! I LOVE BEETS!!! Do you? If you said no, you are most likely with the majority, and quite frankly, you're brave for even viewing this. I remember having my late husband try these beets before I put everything else with them...you'd think I was feeding him gasoline. But, if you're on my side, you will LOVE this recipe. Many beet salads have goat cheese in them, along with being on a bed of greens, and sometimes they are accompanied by toasted hazelnuts rather than walnuts, which I think is better in the fall anyway. This salad will hold for a few days in the frig, as there are no greens involved, but you can put them on a bed of greens to serve. The picture below looks somewhat dull, but this is shot with the prepared salad simply in a bowl. You can deviate from this recipe and add what you like, although my rule of thumb is always to try something as the recipe states the first time around. If you don't want to start with fresh beets, you can always buy beets already peeled and simply roasted...it takes a lot less time, and the spattering of beet juice isn't as bad. You can buy them at Trader Joe's and Costco. If using fresh beets, follow directions for microwaving. As a last resort, use canned. I don't know how many of my friends at work I gave this recipe to, only to have them ask me to bring these beets for a special occasion. My response always was..."why don't YOU make them, you have the recipe!" Heat oven to 400. In a large bowl, whisk balsamic, olive oil, sugar, basil and salt. Taste. The mixture should be sweet/sour. Adjust seasonings. 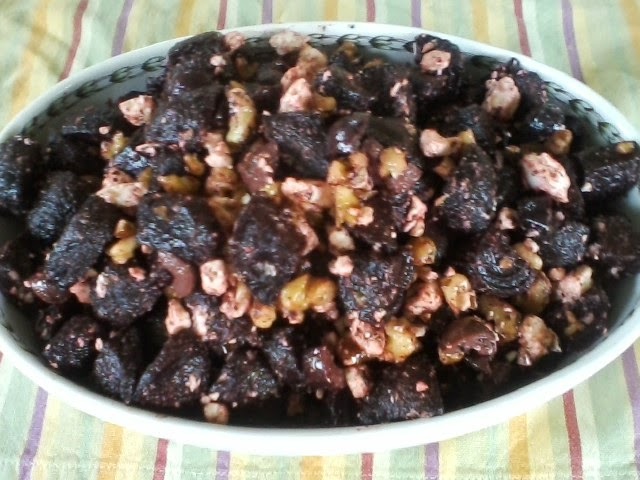 Put beets in bowl and mix thoroughly. Prepare large cookie sheet with sides with a piece of parchment paper. Using a large slotted spoon, remove beets from bowl to cookie sheet. Reserve balsamic liquid. Bake for 15 minutes, then remove from oven and using a large spoon or pancake turner, flip beets so they are re-glazed. Bake for another 10 minutes then check to see if liquid has evaporated. You will probably bake for yet another 10 minutes at this point until they are just about candied. Remove beets and place back in bowl with balsamic liquid. Stir and let cool for about 30 minutes. At this point, if there is a lot of liquid, drain most of it. Add remainder of ingredients and mix well. Feta will eventually turn pink due to the beets. Serve this salad cold or at room temp. Bon appetit! Chicken wings are up there on my "there's no limit to what I can eat" list along with chocolate, kalamata olives and ribs. 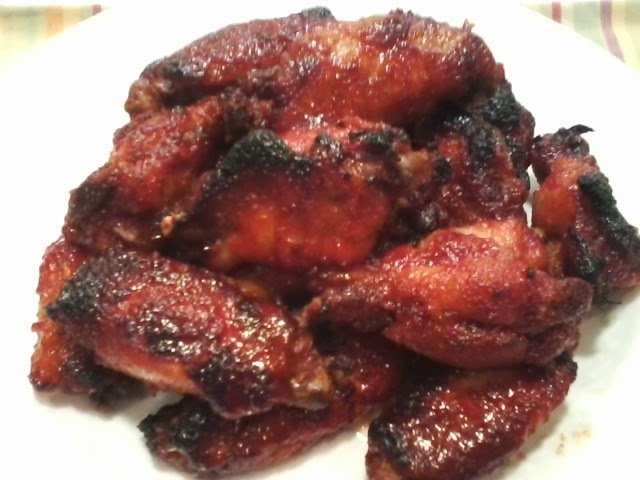 You put the wings in the crock pot and then finish in the oven. Easy and delicious. Good for tail-gating party, picnic or a crowd. Pulse ginger, garlic 1/2 cup sugar, 1 tbsp soy sauce and 1/8 tsp cayenne pepper in a food processor until finely ground. Put mixture into crock pot, add chicken and toss until thoroughly combined. Cover and cook on low until fat renders and chicken is tender, 3-4 hours. Using a slotted spoon, remove wings from crock pot and transfer to large bowl. Discard liquid. Let wings cool for 20 minutes. Adjust oven rack to lower-middle position and heat broiler. Line rimmed baking sheet with heavy duty tin foil or two sheets regular tin foil. Spray foil lightly with baking spray. Whisk water, tomato paste, remaining sugar, soy sauce and cayenne in bowl. 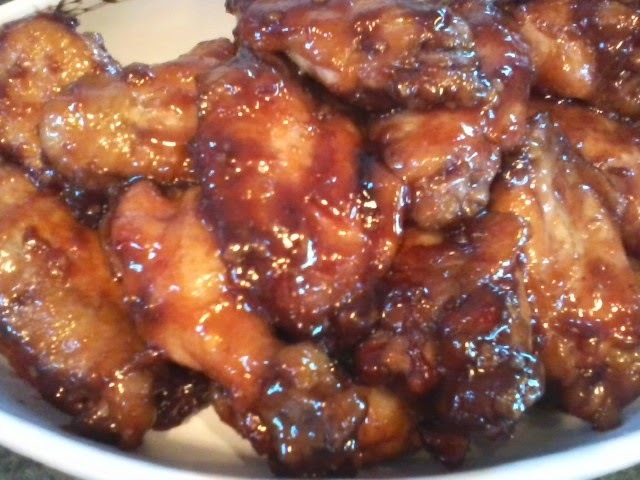 Add half of sauce to bowl with cooled wings and toss gently to coat. Arrange wings, skin side up, on prepared rack. Broil until wings are lightly charred and crisp around edges, about 10-15 minutes. 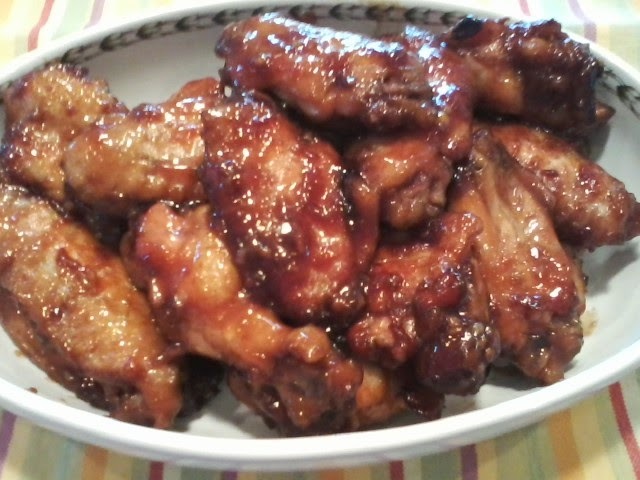 Flip wings, brush with remaining sauce, and continue to broil until well caramelized, about another 3-5 minutes. Bon appetit! Part 2: From Fannie May Candies to Boehm's Candies...40 Years Later! 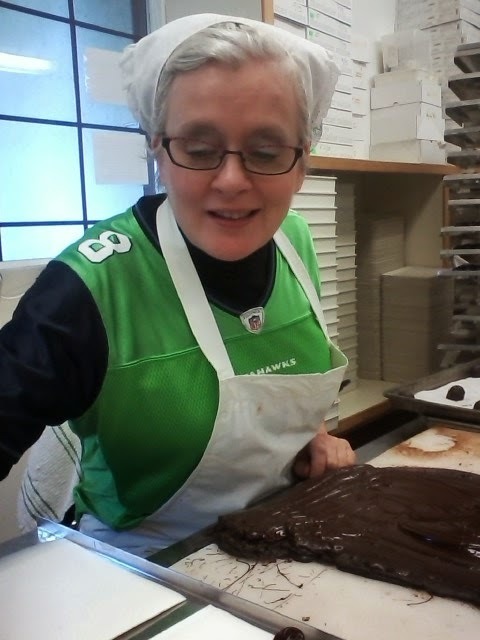 When I was working my previous job at an airline, I would, on occasion, check in Bernard Garbusjuk, who runs Boehm's Candies in Issaquah, Washington. But, whoever checked him in had the hard task of sharing the large bag of candies that he brought for everyone at the ticket counter. We would be like hawks, circling the bag and quickly taking what we claimed to be ours. I lived in Issaquah in 1989, and would stop at Boehm's to watch the candy dippers through the large windows. I was always mesmerized by their craft, and would analyze again and again how they did what they did. But, back to the airport. I would talk to Bernard about the candy dippers and asked him that if he ever needed another one, could I perhaps work there part-time? Found out it wasn't as easy as that, as a candy dipper is a union job, and not easily had. But a few years ago, I found out through my friend at work, Paula, whose daughter, Elizabeth, worked at Boehm's for a few years, that one of their full time packers had left, and they were looking to hire someone. A packer is one who packs boxes of candy by chart, the chart showing what candy should go where in each box. Well, I was on top of that one, because that was one of the things I did at Fannie May. I called Narissa, Bernard's daughter, talked with her for a bit, filled out an application and sent it in. And even though Narissa was looking for someone full time, things weren't going so well, and she called me in to be interviewed for seasonal work during the time between Thanksgiving and Christmas. I told her that because of working at Fannie May, I not only knew how to pack candy by chart, but cup candy, wrap boxes with paper and finish with ribbon. The last 2 items were a mute point, as Boehm's wraps all their boxes by machine and doesn't finish with curling ribbon. But, I was hired, and a star was born! Actually, I did pack boxes, but most of Boehm's selections have an indented form that fits within the box and you put just the candy in, you don't cup it. 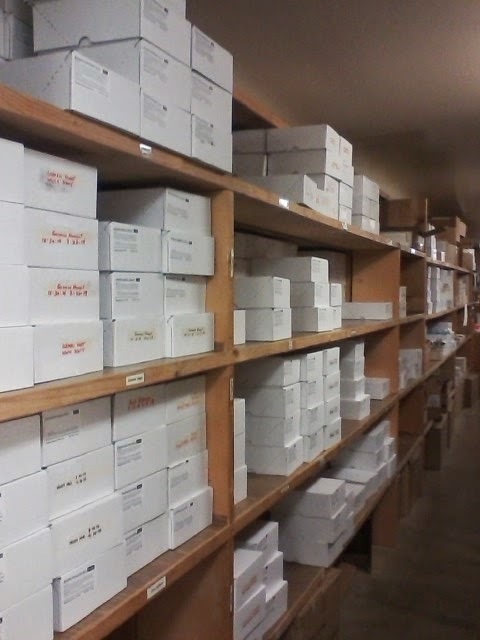 I also got to be a pro at putting boxes together...they came put together at Fannie May, but come flat at Boehm's. I learned how to load candy on the enrober, the machine with 3 belts that cover the candies with chocolate in various stages, and how to bulk box the finished product. We may put 500-2,000 pieces of one candy through the enrober, and they have to be packed in bulk boxes and put on the shelves. 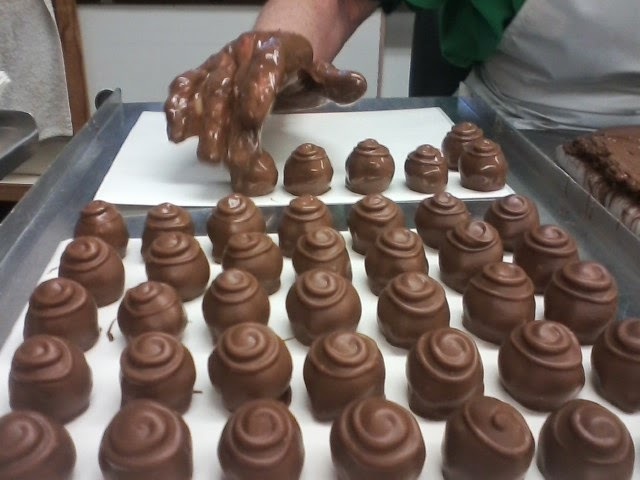 But, the most fun was learning to pipe the different shapes on top of some of the candies. Judy and Amy allowed me to practice some designs, and now actually let me pipe the tops on some of the candy. But even getting to that point takes a little doing. You take a triangular piece of paper and shape into a cone, fill it with tempered chocolate, seal the bag at the top (and a lot of times I fill it too much and the chocolate starts leaking out of each side), cut the tip off the bottom of the bag, and then you have only so much time to do what you need to do as the chocolate cools down rather quickly and then it won't squirt out of the tip of the bag. At Fannie May, all of the candy came to us made from about 20 miles away...usually that day or the day before. But, you still had to know what the tops meant. A straight line across the top meant that the candy was a white buttercream inside. A loop-de-loop meant it was chocolate buttercream inside. A continuous "V" shape meant it was a maple cream, and so on. 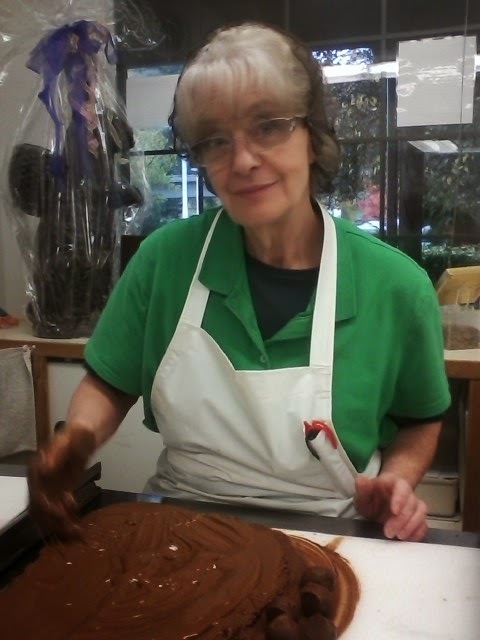 At Boehm's, many of the candies are finished with a shape on top of the candy right after Judy and Amy dip the rolled fondant in chocolate. They circle around a candy, they lift their finger straight up, they do all sorts of stuff. One time they let me try my hand at candy dipping before I started my shift. I tore off a little piece of fondant from a long snake, if you will, rolled it into a round ball, swished my hand in the metal container of chocolate (Judy always does light, and Amy always does dark), rolled the round piece of fondant in the chocolate with one hand, and with that same hand, dropped it onto the wax paper, finishing with whatever design that particular candy got with the chocolate that was left in my hand after dropping it. Sounded easy, but I certainly had my problems...either I let too much chocolate go on top of the candy so there was no design, or I waited too long to drop it onto the paper, because I was playing with it too long, and then the chocolate cooled down enough so it wouldn't drop from the bottom of my hand to produce a design. I don't cotton to "not" getting something after awhile, and this was certainly challenging, but moreso, frustrating. I haven't had the opportunity to practice again, but every time I have the chance, I watch the girls so intently it's almost like I can will myself to perfect it. It's not easy, and Judy and Amy were the first to tell me this after many, many failed attempts. But, I love going there, no matter what I do. Han is the expert at putting chocolate into various molds, Mary runs the shipping end of things, Mary Lee runs the front of the house, or the candy store, DeDe is the packer extraordinaire, Narissa runs the office, and her brother Tyson, now makes the candy, as Monty retired in August. It's amazing how fast the day goes when you're only there 2 days a week. But I love it. As much as a mechanic loves grease on his hands, I love chocolate on mine, and I hope Boehm's will allow me to continue this tradition for many years to come! judy, one of "my two girls"
amy, the other half of "my two girls"
the boxes are dated in red if light chocolate, and black if dark chocolate, then stored on shelves...they never stick around for very long.. 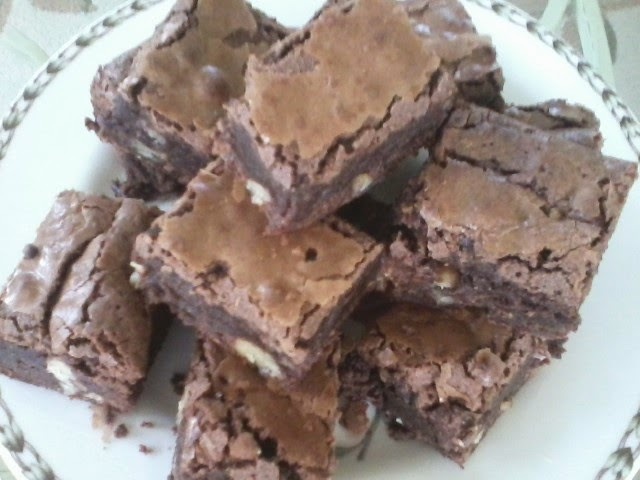 Recipe #44: Ina Garten's Outrageous Brownies...Just About..
A brownie is not "just" a brownie. Just like a chocolate chip cookie isn't "just" a chocolate chip cookie. 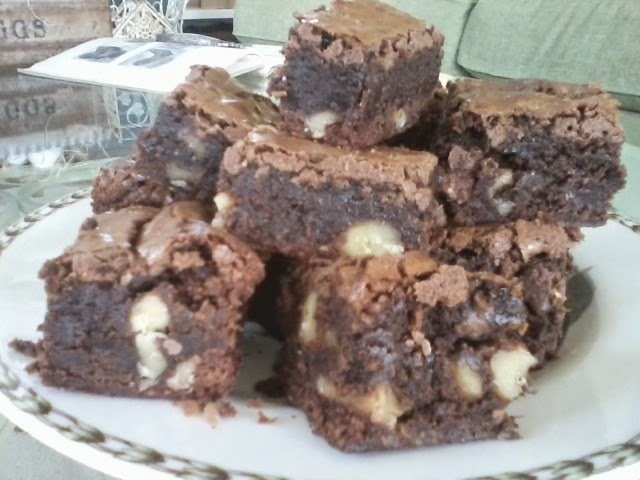 There are brownies and chocolate chip cookies, and there "brownies and chocolate chip cookies." They're both a very personal choice when it comes to how one likes them. 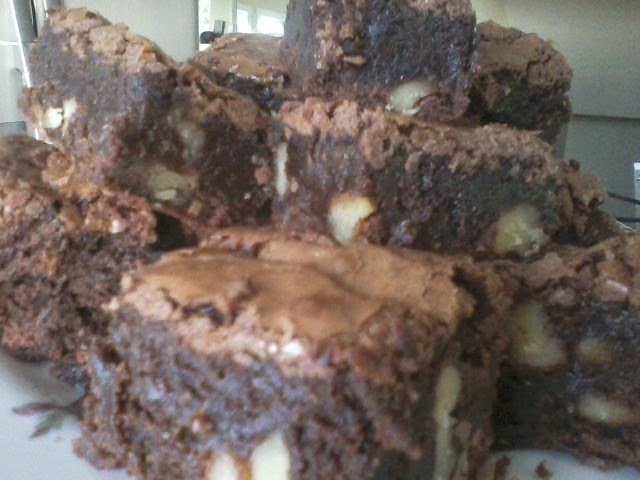 I happen to like a very fudgy brownie, almost to the point of it looking raw in the middle. If you like a cake-like brownie, this is not for you. As for the title, it says just that...just about. First, I cut Ina's recipe in half...I couldn't subject myself to eating a 12x18 pan of brownies...well, I could, but won't. So, with the recipe cut in half, I use a 9x9 pan. Second, I don't use chocolate chips in the brownies..I think they are decadent enough on their own with the walnuts, and sometimes, I have a problem with mixing 2 or 3 textures of chocolate. I also don't refrigerate them after making them. For me, it's sort of like putting a pie or cake in the refrigerator. And for those of you who worked with me, and knew me well, any anniversary cake of mine, or cake, cookie or brownie I ever brought in was never refrigerated. I just feel like it dries out, or loses it creaminess, or its runniness, if it's a pie. And if you're wondering about eating the raw batter...picture a nice warm brownie batter because as part of this, you pour the melted chocolate/butter in the bowl, ending with the flour. I have been known, after pouring the batter into the pan, and having left some in the bowl for myself, to take a another spatula and swipe it across the batter in the pan before putting in the oven....sad, but true..
Heat oven to 350 and line a 9x9 pan with piece of tin foil, then spray with cooking spray. Melt butter, chocolate chips and salt over low heat, stirring occasionally. Allow to cool for 5-10 minutes. In a large bowl, stir together eggs, coffee granules, vanilla and sugar. I use a large slotted spoon for this. Stir in the warm chocolate mixture. Sift together flour and baking powder. 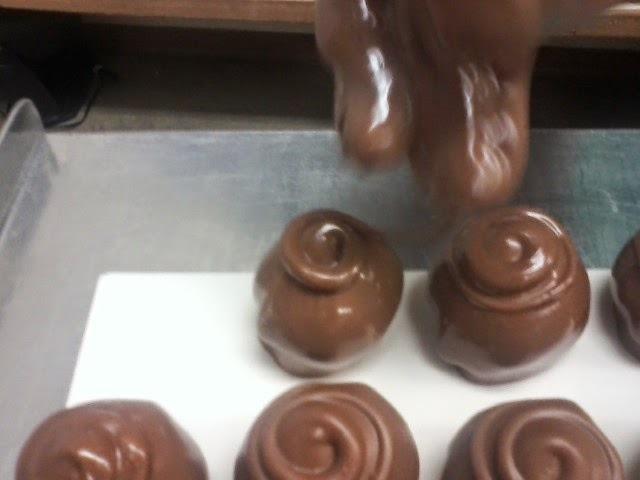 Add to chocolate batter. Bake for about 25 minutes to start. Test with a toothpick after that. You do not want to overbake these brownies. If not done, put back in the oven for 2-3 minutes at a time. You should be putting a toothpick not in the middle of the brownie, but halfway between one corner and the middle, and should get a moist crumb. Be mindful of this, or your brownies will be cakelike. Well, the rest is up to you...bon appetit! My late husband always said mushrooms tasted like the erasers on top of pencils. I always thought more so with snails. I think he would have had a greater appreciation for mushrooms if he had ever tried escargot. 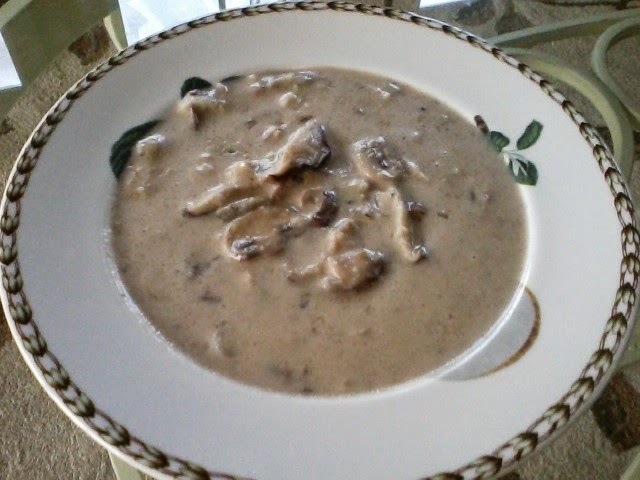 Years ago, mushroom soup was primarily made of white button mushrooms. Today, we have such a vast selection to choose from, but with that selection also comes the price tag. I use four kinds of mushrooms in this soup, though the bigger balance being the domestic white mushroom, for financial reasons. The brandy gives this soup depth, without being overpowering. Please try it...it's really a no-brainer to make. Brush mushrooms clean of all dirt. 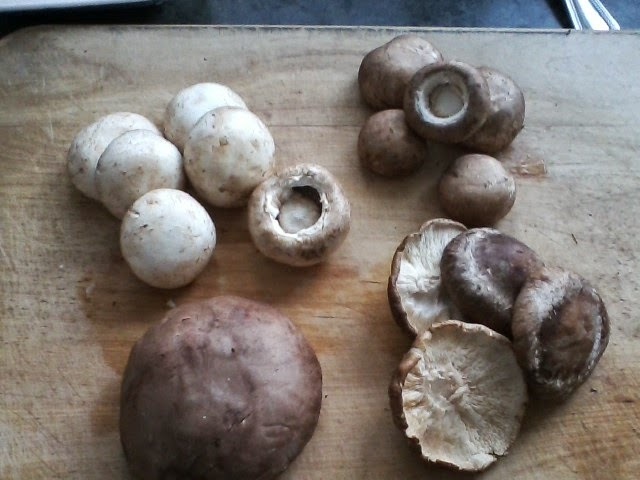 Scrape out gills from the portobello with a spoon. Trim all ends and slice mushrooms. Set aside. In a very large, heavy saucepan over medium heat, melt the butter. When hot, add the shallot and leek and saute, stirring occasionally, until golden brown, about 15 minutes. Add all the mushrooms and saute, stirring frequently, until soft, about 5-7 minutes. Add the flour and stir for a few minutes until fully incorporated into the mushrooms. 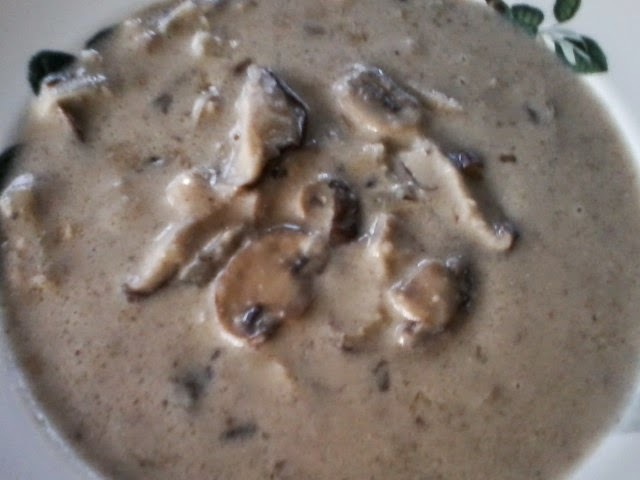 Gradually pour in the chicken stock, stirring until fully mixed with the mushrooms. Raise heat to medium high and add half and half, stirring until mixture thickens and soup just comes to a boil. Reduce heat, add salt, pepper, nutmeg and brandy. Simmer on low for about 20 minutes. At this point, I take a few cups and put in my Nutribullet to liquefy, then put back into the pot. You don't have to do this if you want a very chunky soup, or you can do it with the whole thing if you want a totally creamy soup. Bon appetit!